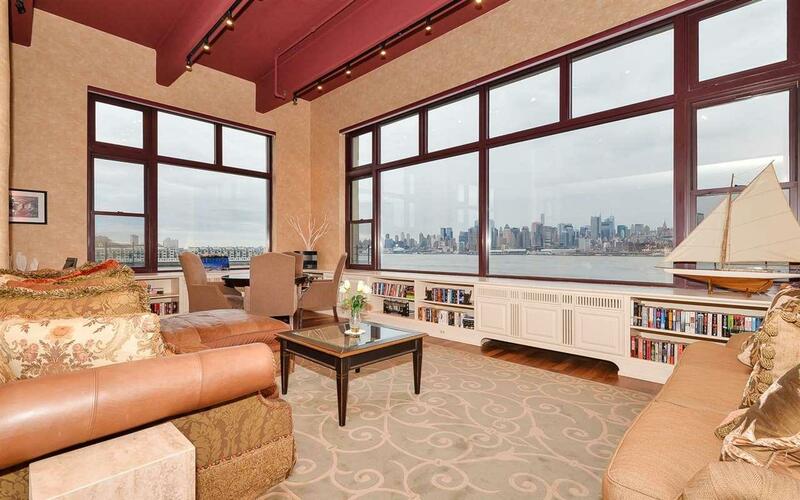 Fabulous Direct Waterfront Views of NYC, Can be sold as is Fully Furnished---Ready to Move In.. The New York City skyline graces the oversized windows, like art work that adorns the walls throughout the 1,585 SF home. Spectacular rooms with high loft ceilings and mahogany floors, make this apartment feel spacious and vast, perfect for entertaining. While admiring the Empire State Building, prepare your food on the granite center island, with seating for casual dining, and enjoy using top brand appliances like the Fisher & Paykel Dish Drawer, Dual Advantium Ovens, Induction type Cooktop, and Liebherr built-in refrigerator. Detail was not lost in the redesigned and expanded master and guest suites. Enjoy your Sunday afternoon reading a book in the master sitting room or taking a power shower in one of the imported Carrera marble bathrooms with heated marble floors. This homes luxury lifestyle expands beyond its front door. The Hudson Tea building includes 24-hour concierge services, fitness center, residents private lounge and ease of access to Manhattan with the ferry located a few blocks away or a shuttle to the PATH. The discerning buyer wanting a luxury lifestyle will appreciate the attention to detail, unprecedented views, and the wealth of opportunities this home, building and surrounding area have to offer. Listing provided courtesy of Special Properties Real Estate Services, Llc:201-962-9551.